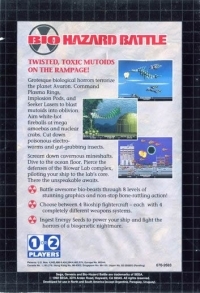 Box Text: Twisted, toxic mutoids on the rampage! Grotesque biological horrors terrorize the planet Avaron. Command Plasma Rings, Implosion Pods and Seeker Lasers to blast mutoids into oblivion. Aim white-hot fireballs at mega amoebas and nuclear crabs. Cut down poisonous electro-worms and gut-grabbing insects. Scream down cavernous mineshafts. Dive to the ocean floor. Pierce the defensed of the Biowar Lab complex, piloting your ship to the lab's core. There the unspeakable awaits. # Battle awesome bio-beasts through 8 levels of stunning graphics and non-stop bone-rattling action! # Choose between 4 Bioship fightercraft each with 4 completely different weapons systems. # Ingest Energy Seeds to power your ship and fight the horrors of a biogenetic nightmare. 09-15-2018 josepy Box Text Twisted, toxic mutoids on the rampage! Grotesque biological horrors terrorize the planet Avaron. Command Plasma Rings, Implosion Pods and Seeker Lasers to blast mutoids into oblivion. Aim white-hot fireballs at mega amoebas and nuclear crabs. Cut down poisonous electro-worms and gut-grabbing insects. Scream down cavernous mineshafts. Dive to the ocean floor. Pierce the defensed of the Biowar Lab complex, piloting your ship to the lab's core. There the unspeakable awaits. # Battle awesome bio-beasts through 8 levels of stunning graphics and non-stop bone-rattling action! # Choose between 4 Bioship fightercraft each with 4 completely different weapons systems. # Ingest Energy Seeds to power your ship and fight the horrors of a biogenetic nightmare. 09-21-2011 hexen Box Text Twisted, toxic mutoids on the rampage! Grotesque biological horrors terrorize the planet Avaron. Command Plasma Rings, Implosion Pods and Seeker Lasers to blast mutoids into oblivion. Aim white-hot fireballs at mega amoebas and nuclear crabs. Cut down poisonous electro-worms and gut-grabbing insects. Scream down cavernous mineshafts. Dive to the ocean floor. Pierce the defensed of the Biowar Lab complex, piloting your ship to the lab's core. There the unspeakable awaits. 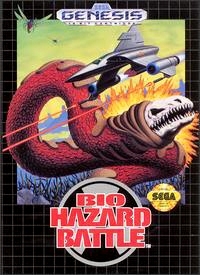 This is a list of VGCollect users who have Bio-Hazard Battle in their Collection. This is a list of VGCollect users who have Bio-Hazard Battle in their Sell List. This is a list of VGCollect users who have Bio-Hazard Battle in their Wish List.